One might ask what the downwash from a wing looks like. The downwash comes off the wing as a sheet and is related to the details on the load distribution on the wing. Figure 18 shows, through condensation, the distribution of lift on an airplane during a high-g maneuver. From the figure one can see that the distribution of load changes from the root of the wing to the tip. Thus, the amount of air in the downwash must also change along the wing. The wing near the root is "virtual scooping" up much more air than the tip. Since the wing near the root is diverting so much air the net effect is that the downwash sheet will begin to curl outward around itself, just as the air bends around the top of the wing because of the change in the velocity of the air. 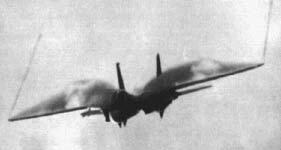 This is the wing vortex. The tightness of the curling of the wing vortex is proportional to the rate of change in lift along the wing. At the wing tip the lift must rapidly become zero causing the tightest curl. This is the wing tip vortex and is just a small (though often most visible) part of the wing vortex. Returning to Figure 7 one can clearly see th development of the wing vortices in the downwash as well as the wing tip vortices. Winglets (those small vertical extensions on the tips of some wings) are used to improve the efficiency of the wing by increasing the effective length, and thus area, of the wing. The lift of a normal wing must go to zero at the tip because the bottom and the top communicate around the end. The winglet blocks this communication so the lift can extend farther out on the wing. Since the efficiency of a wing increases with area, this gives increased efficiency. One caveat is that winglet design is tricky and winglets can actually be detrimental if not properly designed.